Dentures are removable replacements for missing teeth and the surrounding gum tissues. At Gold Hill Dentistry, we offer both complete and partial dentures to those who want to fill the gap(s) that their missing teeth have left. 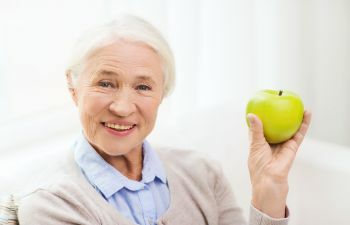 Complete dentures are used when all of the teeth are missing or have been extracted, while partial dentures are used when there are still natural teeth remaining in the mouth. Dr. Kavi Sagunarthy understands the importance of restoring missing teeth and providing full function back to the mouth. At Gold Hill Dentistry, we have a friendly and professional staff. Our team works hard to provide exceptional restorative dental care to all o four patients in the most comfortable and caring environment. We understand that although the outward goal of dentures is to make the gaps in the teeth invisible, the well being of the mouth as a whole is our greatest concern. When a person’s mouth has gaps between the teeth, tooth decay can occur at a rapid rate. The bone structure begins to weaken and can cause the surrounding teeth to decay and fall out. With proper care and professional denture treatment, full function, improved appearance, and the future health of the mouth can be gained. Gold Hill Dentistry is currently accepting new patients. You can trust our dental team for their expertise in denture treatments. We put the well being of our patients first as soon as they enter our office. Our well-equipped dental practice is full of the amenities that you need to help you relax before and during your denture appointment. We are committed to helping those who need replacement teeth achieve a healthy and beautiful smile.